Ok, so I am starting fresh for the Enforcer. Until I figure out how to send UT assets for you guys to try out for yourselves. I am going to post a video here. For this clip I created the weapon raise and lower sound as well as primary and secondary fire. Take a peak and list some suggestions. I am going to do the same with the Flak and the Shock as well. Thumbs up on Enforcer V03 Rev02 ! I think that should be a sound fx part from the weapon? same goes for the flakcannon i guess. 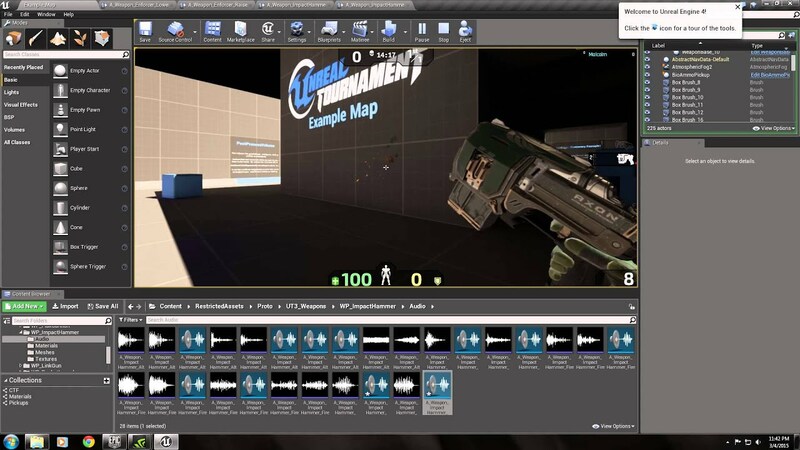 So, quick update guys, I am going off on a holiday where I won't have access to my computer T_T, but I promise I will get back into the thick of things with Enforcer updates, Shock Rifle, and even get into UI sounds, foley etc. I am not dead I promise!! Best of times to all of your guys. Not gonna lie, it does not sound pretty. The scraping sounds overpower the oomph of the bullets firing. And the rest sounds so similar to one another, making it indistinguishable if the enforcer's raised up, put away, ammo or the gun is picked up. Can't find any positives of the sounds, sorry. For me v3 was clearly better than v4. I really like v3 mix 03. I can't really explain how other than the midrange sounds just seem more fitting (in my imagination) with the v3 one. Last edited by RPGWiZ4RD; 02-04-2015, 06:25 PM. No worries, you were specific on what bothered you about the sound. Something I can work with. Thanks! I did intentionally wanted the sounds to be similar to each other to signify that they all belong to the Enforcer, but perhaps it needs to be a bit more varied. V03 had a longer treble tail than v04 which is shorter but more impactful. I can see your point though, I can explore it a bit more and perhaps split the difference. Thanks! Welcome. Here's hoping that Rev05 is gonna be kick ***. The pull-up and -down sounds got some energy vibe for me. Not sure if that fits the enforcer. The shooting sound is great, gives the enforcer a sense of power.